Sketchbooks opened to show pages of drawing assignments finished by Bob Glover as a student of fine arts at the University of Georgia. All sketches were done in the late 1950s. Click your mouse on a sketchbook's pages for comments by the student-artist about what it shows. Some sketches were done of models (example) others using photographs and textbook drawings as references. The latter were done as studies of the human form, for example the arm muscles in on the left of the sketchbook pages immediately above. The open sketchbook (page up) at the top of this page is shown in the page header for this section of Bob Glover.com. Click your mouse on it there and you link to the page you are viewing. Likewise, the center page header graphic showing the sketchbook open with the palmetto palm is a link to what you see below. 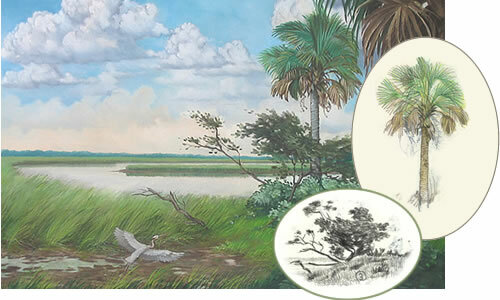 The artist's painting, Coastal Marsh / South Carolina, is shown above with two overlays of sketchbook items making it an example of the use of sketches from various times and places to put together a finished piece. The painting of the costal marsh is not of a real place. It's a creation from the artist mind and eye. CLICK HERE to see the palmetto palm on its sketchbook page. CLICK HERE to see the bush and limbs sketched at a marsh overlook near Kiawah Island, SC. All of the various sketches that went into creating the scene are from the same general area of South Carolina. Sketch of the artist's model (1959). Page up for more sketches.